1Ph.D. student, Faculty of Mechanical Engineering, K.N. Toosi University of Technology, Tehran, Iran. technique have excellent accuracy for wide range of nonlinear parameters and predict system behavior precisely. Two semi-analytical methods, HAM and Homotopy Pade techniques are used. The methods are used to obtain nonlinear forced vibration response of a beam. Beam is subjected to transverse harmonic load and axial force. Analytical results are compared with experimental results of literature. Excellent accuracy is found for wide range initial deflection and beam characeristics. M.T. Ahmadian, M. Mojahedi, Free vibration analysis of a nonlinear beam using homotopy and modified lindstedt-poincare methods, Journal of Solid Mechanics, 1 (2009). L. Azrar, R. Benamar, R.G. White, Semi-analytical approach to the non-linear dynamic response problem of S–S and C–C beams at large vibration amplitudes part I: General theory and application to the single mode approach to free and forced vibration analysis, Journal of Sound and Vibration, 224 (1999) 183-207. J.H. He, Α Review on Some New Recently Developed Nonlinear Analytical Techniques, International Journal of Nonlinear Sciences and Numerical Simulation, 1 (2000) 51-70. J.H. He, Modified Lindstedt–Poincare methods for some strongly non-linear oscillations: Part I: expansion of a constant, International Journal of Non-Linear Mechanics, 37 (2002) 309-314. N. Mohammadi, Nonlinear vibration analysis of functionally graded beam on Winkler-Pasternak foundation under mechanical and thermal loading via perturbation analysis method, Technology, 3 (2015) 144-158. A.H. Nayfeh, Introduction to perturbation techniques, Wiley-Interscience, New York, (1981). S.R.R. Pillai, B.N. Rao, On nonlinear free vibrations of simply supported uniform beams, Journal of sound and vibration, 159 (1992) 527-531. M.I. Qaisi, Application of the harmonic balance principle to the nonlinear free vibration of beams, Applied Acoustics, 40 (1993) 141-151. H.M. Sedighi, K.H. Shirazi, J. Zare, An analytic solution of transversal oscillation of quintic non-linear beam with homotopy analysis method, International Journal of Non-Linear Mechanics, 47 (2012a) 777-784. H.M. Sedighi, K.H. Shirazi, A. Noghrehabadi, Application of recent powerful analytical approaches on the non-linear vibration of cantilever beams, International Journal of Nonlinear Sciences and Numerical Simulation, 13 (2012b) 487-494. J.N. Reddy, I.R. Singh, Large deflections and large‐amplitude free vibrations of straight and curved beams, International Journal for numerical methods in engineering, 17 (1981) 829-852. B.S. Sarma, T.K. Varadan, Lagrange-type formulation for finite element analysis of non-linear beam vibrations, Journal of sound and vibration, 86 (1983) 61-70. Y. Shi, C. Mei, A finite element time domain modal formulation for large amplitude free vibrations of beams and plates, Journal of Sound and Vibration, 193 (1996) 453-464. S.J. Liao, An approximate solution technique not depending on small parameters: a special example, International Journal of Non-Linear Mechanics, 30 (1995) 371-380. S. Liao, Beyond perturbation: introduction to the homotopy analysis method, CRC press, 2003. S.J. Liao, A.T. Chwang, Application of homotopy analysis method in nonlinear oscillations, Journal of applied mechanics, 65 (1998) 914-922. S. Li, S.J. Liao, An analytic approach to solve multiple solutions of a strongly nonlinear problem, Applied Mathematics and Computation, 169 (2005) 854-865. E.B. Saff, R.S. Varga, Padé and Rational Approximation: Theory and Applications: Proceedings of an International Symposium Held at the University of South Florida, Tampa, Florida, December 15-17, 1976, Academic Press, 1977. L. Wuytack, Commented bibliography on techniques for computing Padé approximants, Padé Approximation and its Applications, (1979) 375-392. M.H. Kargarnovin, R.A. Jafari-Talookolaei, Application of the homotopy method for the analytic approach of the nonlinear free vibration analysis of the simple end beams using four engineering theories, Acta Mechanica, 212 (2010) 199-213. T. Pirbodaghi, M.T. Ahmadian, M. Fesanghary, On the homotopy analysis method for non-linear vibration of beams, Mechanics Research Communications, 36 (2009a) 143-148. T. Pirbodaghi, S.H. Hoseini, M.T. Ahmadian, G.H. Farrahi, Duffing equations with cubic and quintic nonlinearities, Computers & Mathematics with Applications, 57 (2009b) 500-506. M. Fooladi, S.R. Abaspour, A. Kimiaeifar, M. Rahimpour, On the analytical solution of Kirchhoff simplified model for beam by using of homotopy analysis method, World Applied Sciences Journal, 6 (2009) 297-302. S.H. Hoseini, T. Pirbodaghi, M.T. Ahmadian, G.H. Farrahi, On the large amplitude free vibrations of tapered beams: an analytical approach, Mechanics Research Communications, 36 (2009) 892-897. A.A. Motallebi, M. Poorjamshidian, J. Sheikhi, Vibration analysis of a nonlinear beam under axial force by homotopy analysis method, Journal of Solid Mechanics Vol, 6 (2014) 289-298. R.A. Jafari-Talookolaei, M.H. Kargarnovin, M.T. Ahmadian, M. Abedi, An investigation on the nonlinear free vibration analysis of beams with simply supported boundary conditions using four engineering theories, Journal of Applied Mathematics, 2011 (2011). A. Fereidoon, D.D. Ganji, H.D. Kaliji, M. Ghadimi, Analytical solution for vibration of buckled beams, International Journal of Research and Reviews in Applied Sciences, 4 (2010) 17-21. W. Lacarbonara, A.H. Nayfeh, W. Kreider, Experimental validation of reduction methods for nonlinear vibrations of distributed-parameter systems: analysis of a buckled beam, Nonlinear Dynamics, 17 (1998) 95-117. A.M. Abou-Rayan, A.H. Nayfeh, D.T. Mook, M.A. Nayfeh, Nonlinear response of a parametrically excited buckled beam, Nonlinear Dynamics, 4 (1993) 499-525. A.A. Afandeh, R.A. Ibrahim, Nonlinear response of an initially buckled beam with 1: 1 internal resonance to sinusoidal excitation, Nonlinear Dynamics, 4 (1993) 547-571. S.A. Ramu, T.S. Sankar, R. Ganesan, Bifurcations, catastrophes and chaos in a pre-buckled beam, International Journal of Non-Linear Mechanics, 29 (1994) 449-462. W. Kreider, A.H. Nayfeh, Experimental Investigation of Single-Mode Reponses in a Fixed-Fixed Buckled Beam, Nonlinear Dynamics, 15 (1998) 155-178. A.H. Nayfeh, W. Kreider, T.J. Anderson, Investigation of natural frequencies and mode shapes of buckled beams, AIAA journal, 33 (1995) 1121-1126. J.C. Ji, C.H. Hansen, Non-linear response of a post-buckled beam subjected to a harmonic axial excitation, Journal of Sound and Vibration, 237 (2000) 303-318. W. Lestari, S. Hanagud, Nonlinear vibration of buckled beams: some exact solutions, International Journal of Solids and Structures, 38 (2001) 4741-4757. G.B. Min, J.G. Eisley, Nonlinear vibration of buckled beams, Journal of Engineering for Industry, 94 (1972) 637-645. W.Y. Tseng, J. Dugundji, Nonlinear vibrations of a buckled beam under harmonic excitation, Journal of applied mechanics, 38 (1971) 467-476. W. Lacarbonara, A theoretical and experimental investigation of nonlinear vibrations of buckled beams, Virginia Polytechnic Institute and State University. http://scholar. lib. vt. edu/theses/public/etd-441520272974850/wlacarbo. pdf, (1997). J.G. Eisley, Large amplitude vibration of buckled beams and rectangular plates, AIAA Journal, 2 (1964) 2207-2209. T. Smelova-Reynolds, E.H. Dowell, The role of higher modes in the chaotic motion of the buckled beam—I, International journal of non-linear mechanics, 31 (1996) 931-939. T. Smelova-Reynolds, E.H. Dowell, The role of higher modes in the chaotic motion of the buckled beam—II, International journal of non-linear mechanics, 31 (1996) 941-950. D.M. Tang, E.H. Dowell, On the threshold force for chaotic motions for a forced buckled beam, Journal of Applied Mechanics, 55 (1988) 190-196. F. Tajaddodianfar, M.R. Hairi-Yazdi, H. Nejat-Pishkenari, Nonlinear dynamics of MEMS/NEMS resonators: analytical solution by the homotopy analysis method, Microsystem Technologies, 23 (2017) 1913-1926. 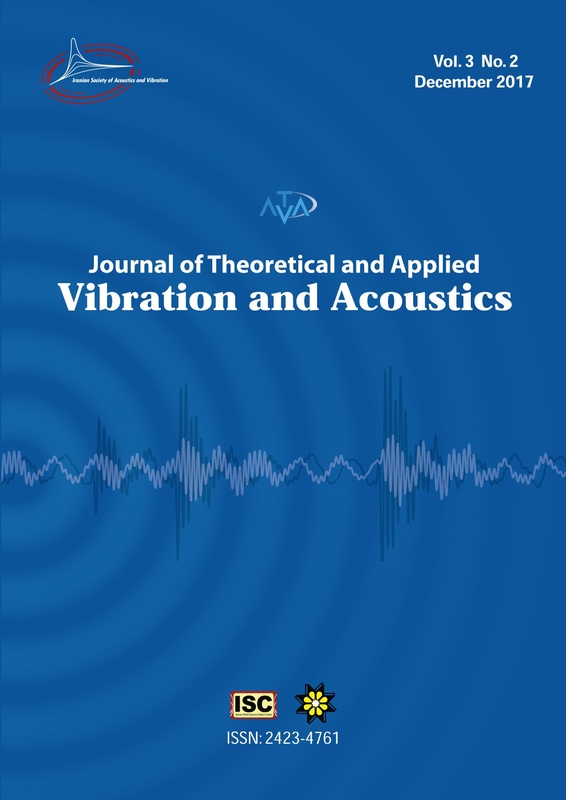 M. Rezaee, M. Minaei, A theoretical and experimental investigation on large amplitude free vibration behavior of a pretensioned beam with clamped–clamped ends using modified homotopy perturbation method, Proceedings of the Institution of Mechanical Engineers, Part C: Journal of Mechanical Engineering Science, 230 (2016) 1615-1625.